Lime has been used as the principal binder for mortars and plasters for the past 10,000 years. The earliest surviving example dates from around 8000 BC in a floor in Turkey. It was only the introduction of cement in the middle of the 19th century, which led to the decline in the use of lime, culminating in its virtual disappearance by the mid 20th century. Emerging evidence in the 1970s of the damage caused to historic buildings by the use of cement mortars and modern plasters has led to a revival in the use of lime over the past 20 years, not only for conservation but also for new build, see Why Use Lime. The production process is interesting. 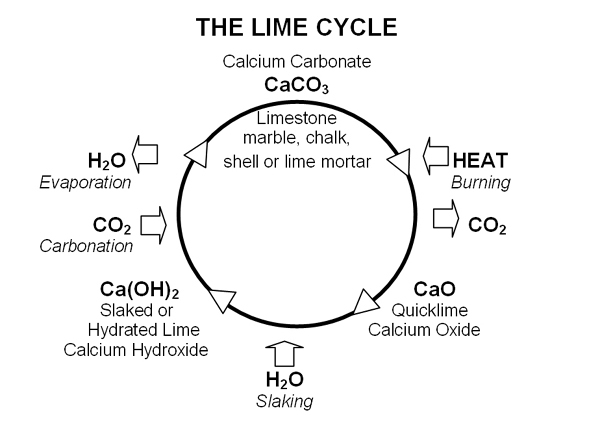 First, quicklime is created by burning limestone, marble, chalk or shell at above 900ºC to drive off carbon dioxide. If the material being burnt is pure calcium carbonate, then pure quicklime is produced. If the material being burnt contains impurities, typically aluminium and magnesium silicates, then hydraulic quickime is produced. When lime is mixed with an aggregate, lime mortar is created. Lime plasters normally also have animal hair added. When exposed to air, both pure lime and hydraulic lime mortars and plasters harden by reabsorbing carbon dioxide to become calcium carbonate again. This is called carbonation. In addition, in hydraulic lime mortars, the silicates produce a chemical set. Pure lime mortars and plasters made from putty or powder can be used for many building purposes other than externally in exposed positions. Putty is generally considered to be more reliable but provided mortars and plasters made from powder are allowed to mature for a few days prior to use, satisfactory results may be achieved. An accelerated chemical set can be induced in pure lime mortars and plasters by the addition of pozzolans, such as clays, brick dust or volcanic ash which provide the necessary silicates. Hydraulic lime mortars and plasters set faster and harder than pure limes and are more often used for exterior coatings and masonry, especially in exposed or damp situations. The strength of the chemical set increases with the proportion of silicates. At high strength, these become as strong as cement, though never as hard, brittle or impermeable. Pure limes, hydraulic limes and cements form a broad spectrum of materials, click here for an article on the lime spectrum, reproduced by permission of the Institute of Historic Building Conservation. Limewash, which is used for coating both external and internal masonry and plaster, is, in its simplest form, produced by mixing either pure or hydraulic lime with water to a thin cream consistency. © The Building Limes Forum. All Rights Reserved.